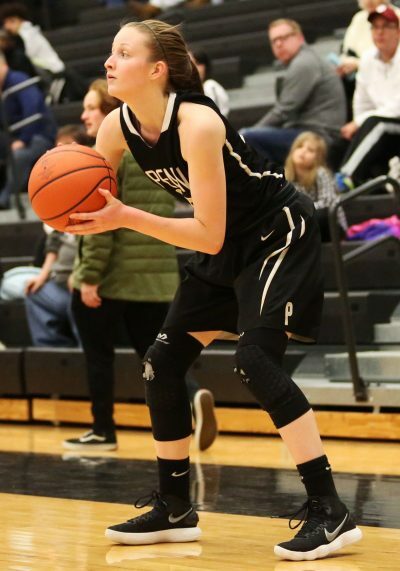 Reganne Pate, a member of the Penn Girls Basketball team, began playing basketball at a young age, all thanks to her older sister Kailey Pate. Pate would go to all of her sister’s games and enjoyed shooting and dribbling around while waiting for her sister’s long practices to be over. Pate is mostly recognized for her ability to shoot 3-point shots, but it does not just come natural to her. She is always working to improve her skills and practices shooting daily. “Shooting is repetition and confidence, which comes from practicing everyday,” Pate said. Pate loves playing Kingsmen Basketball.